Richard Jury is meeting Tom Williamson at Vertigo 42, a bar on the forty-second floor of an office building in London’s financial district. Despite inconclusive evidence, Tom is convinced his wife, Tess, was murdered seventeen years ago. The inspector in charge of the case was sure Tess’s death was accidental—a direct result of vertigo—but the official police inquiry is still an open verdict and Jury agrees to re-examine the case. Jury learns that a nine-year-old girl fell to her death five years before Tess at the same place in Devon where Tess died, at a small house party. Jury seeks out the five surviving party guests, who are now adults, hoping they can shed light on this bizarre coincidence. Ultimately, four deaths—two in the past, two that occur on the pages of this intricate, compelling novel—keep Richard Jury and his sidekick Sergeant Wiggins running from their homes in Islington to the countryside in Devon and to London as they try to figure out if the deaths were accidental or not. And, if they are connected. 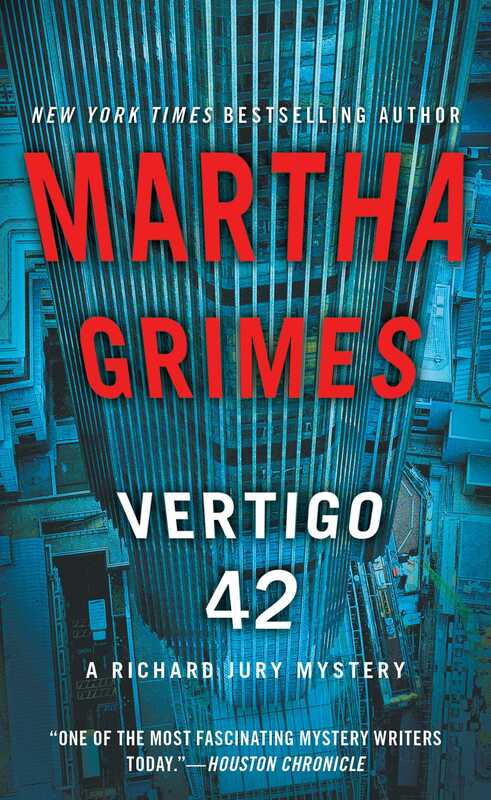 Witty, well-written, with literary references from Thomas Hardy to Yeats, Vertigo 42 is a pitch perfect, page-turning novel from a mystery writer at the top of her game. It was far too high to see Old Broad Street down below, but the windows that traveled all the way around the lozenge-shaped room gave as great a view of London as he’d ever seen. The Thames, Westminster, St. Paul’s, Southwark, everything miniaturized. He was so high up he fancied he’d almost had an attack of vertigo on the fast elevator that made only one stop, and that one at the top of Tower 42: Vertigo. Jury was looking down at the Thames, moving off in one direction toward Gravesend and Gallions Reach, which he couldn’t of course see; in the other direction, the Isle of Dogs, Richmond, and Hampton Court. He tried to picture all of those ships that had once steamed toward London’s docks, toward Rotherhithe and the Blackwall Basin in the not-so-distant past, and in just such light as Jury was seeing now, the sun setting on St Paul’s. In the deep sunset hovering over buildings, the outlines blurred. They might have been dark hills. He was looking toward Docklands, an area that used to comprise the West India Docks and beyond to the Blackwell Basin, one thing that remained after the docks closed. Eighty-some acres of what was now the Canary Wharf estate. Hundreds of dockers had once lived and worked there; now it was office workers, glass buildings, and converted warehouses. Vertigo 42, this bar at the top of one of the financial towers in the “square mile” that made up the City of London—London’s financial district—might have been designed to create the illusion of a city down there. Or perhaps that thought was merely brought on by the champagne Jury was drinking. Champagne was something he never drank and wasn’t used to; but that’s what you got up here, that’s why people came here—to drink champagne. The champagne had been brought by a waiter “at the request of Mr. Williamson, sir.” The waiter set down two glasses and poured into one of them. Jury drank. He had forgotten champagne; he had certainly forgotten great champagne, if he’d ever known it at all. This lot (he had checked the wine list) was costing Mr. Williamson in the vicinity of 385 quid. One bottle. That much. It was Krug. Was wine this expensive meant to be swallowed? Or just held in the mouth as the eye held on to the barges streaked with orange light there on the river. The waiter returned with a dish of incandescent green olives, big ones; he placed them on the counter that ran beneath the window and between the rather trendy-looking but very comfortable chairs. Jury was there to meet not an old friend, but a friend of an old friend, Sir Oswald Maples. The friend of the friend was Williamson, who had ordered the champagne. Oswald Maples had asked Jury if he could spare some time to talk to Tom Williamson, and Jury said, “Of course. Why?” To which Oswald had said, “You’ll see.” Jury filled his glass again before he moved to another window and another view of the Thames. “My favorite view,” said a voice behind him. Jury turned. The thanks came without a pause between it and the river traffic. The way he talked, the directness, as if he didn’t want to waste any time, made Jury smile. Williamson had yet to remove his coat, which he now did, and tossed it over one of the coolly blue amoeba-shaped chairs. “Yes. I don’t come here often.” He sat back. “Perhaps I chose it because up here is quite literally above it all.” He sipped some champagne. “Your wife?” Jury looked over his shoulder, quite stupidly, as if he expected to find Tess there, behind their chairs. Somehow, Jury had known that, even as he turned to look for her. It had grown dark now and the lights had come on along the Embankment and across the river in Southwark. “I met Tess in Norfolk, along the coast. We liked to watch the lights in the harbor. That’s the other reason I like this bar. Down there. The lights coming on.” He stopped. Jury felt disturbed by this accounting because he knew behind it lay another accounting. As if Keats might help out here. Then to keep going, Tom took a pack of Silk Cuts from his pocket, stuck one in his mouth before he remembered to offer the pack to Jury, who, after gazing at the cigarette for half his life, declined. Tom lit one with a cheap, no-nonsense lighter, which he placed on the table beside the cigarettes. The man was obviously wealthy but didn’t express it in silver cigarette cases and lighters. “That’s an understatement, Mr. Williamson.” Jury felt, for some reason, oddly forlorn. “No.” His fingers were on the stem of his champagne flute. He turned and turned the glass. “No. It was the way Tess was lying.” He looked toward the window. Jury was sure he wasn’t seeing London beyond it. He did not answer but rose and took a couple of steps toward the window. Jury had the strange feeling Tom was in some way reentering his wife’s death, standing there as if there were a stone stairway down to Old Broad Street. Then he turned back, sat down. “There was an incident, something pretty dreadful that involved Tess five years before she died. I said ‘incident.’ Ridiculous. It was more than that; it was another accident at the same house, the same rear gardens . . .” He rubbed the heel of his palm against the side of his head, as if trying to call something up. “Tess had a party for some children at Laburnum. That’s the name of our Devon house. Six of them, the children. Tess was very fond of children and we had none, unfortunately. She would get up parties for kids, their birthdays, or holidays, even arcane Welsh or Scottish holidays most of us have never heard of . . .” He moved his shoulders a little, as if resettling a coat around his neck. As if he were cold. “Anyway”—he continued with the story—“at one of these parties at Laburnum, a child named Hilda Palmer fell into one of the drained pools. They were concrete pools, fairly deep. They should have been filled or fenced and Tess was in the process of organizing that; she was lining up an Exeter firm; unfortunately it hadn’t been done yet. Of course, the kids had been told not to play at the rear of the house in the gardens around those pools. But Hilda went round, apparently, when they were playing, got near the pool, missed her footing, and fell in. “Tess was in the house, getting the cake and other party food ready. It was somebody’s birthday. She heard a shout, some noise. The kids were supposed to keep to the front of the house—this is a large house, as I told you, with extensive gardens and woods. Tom closed his eyes briefly, shaking his head. “The children told her they were playing hide-and-seek. So they didn’t see which way the others had gone. Behind a tree, into the maze, into the shrubbery . . . They were all in different places.” Nervously, Tom picked up his packet of cigarettes and lit one. Tom shook his head. “This was the inference Tess drew. No one saw anything. When she discovered the girl was dead she yelled for help. Elaine Davies, a friend of Tess, and the kids all came running. Tess called the police; the ambulance came; detectives and all of their people came. Tom motioned a waiter over and ordered Laphroaig 18. Not what Jury would have chosen, only because he couldn’t afford it. “Not according to police forensics. The forensic testimony was rather amazing. Both of them had very good evidence for reaching these conclusions. Finally, it was an open verdict. The evidence wasn’t conclusive. The waiter appeared and set down the two drinks, offered snacks, which they both declined. “Yes. When I was talking to Oswald, he said he had a good friend who was a superintendent at New Scotland Yard. That got me thinking . . . Well, I’ll certainly understand if you don’t—” Tom Williamson rubbed again at his wrist at the place where the watch wasn’t. “You mean try to reopen the case? That would be somewhat—unorthodox, wouldn’t it? Someone in my position interfering with someone in his position?” To say nothing of being highly improper, against every tenet of police procedure, against propriety, and, probably, against the queen. Jury could hardly wait to ring him. “Right. Sorry. I know it’s a harebrained idea.” Tom Williamson tossed back the rest of his whiskey. “That should do it.” Jury set down his glass. “Of course.” Jury was happy to be alone here at the top of Tower 42, looking out on a London that at this point was inaccessible to him and he to it. He rose to move closer to the window. Tess Williamson would not have been able to look down on London without being terrified, he supposed. Tom Williamson was back, sitting down, picking up his drink. Jury joined him. The Zetter was where he had met Lu Aguilar; she had then been a detective inspector with Islington police. And she was now, after a terrible car wreck and its aftermath of weeks in a coma, back home in Brazil. She had regained consciousness, but the consciousness wasn’t telling her much. Jury was a stranger.